Students in the interterm Outdoor Adventure Leadership course at MacLeish Field Station. The next two minutes were marked by laughter and the frantic sound of hands in motion as a series of creative knots were tied—and retied. When the timer went off again, students passed the knots around the circle and waited excitedly to see who could untie them first. The exercise, led by Lynn Albright ’19, was among the final projects presented by students in the interterm “Outdoor Adventure Leadership” course. At a January 16 campout at the field station in Whately, students steered each other through challenges ranging from role-playing different leadership styles to developing instructions for a perfect paper airplane flight. Among the skills students practiced during the two-week course were rock climbing, trailblazing with compasses, and cooking outdoors on backpacking stoves. They also read education reformer John Dewey’s Experience and Education to spark discussion about how hands-on experience helps foster learning—and leadership. The varied activities were “a helpful and necessary reminder that there is a whole wealth of knowledge beyond education in the traditional academic sense,” Albright said. 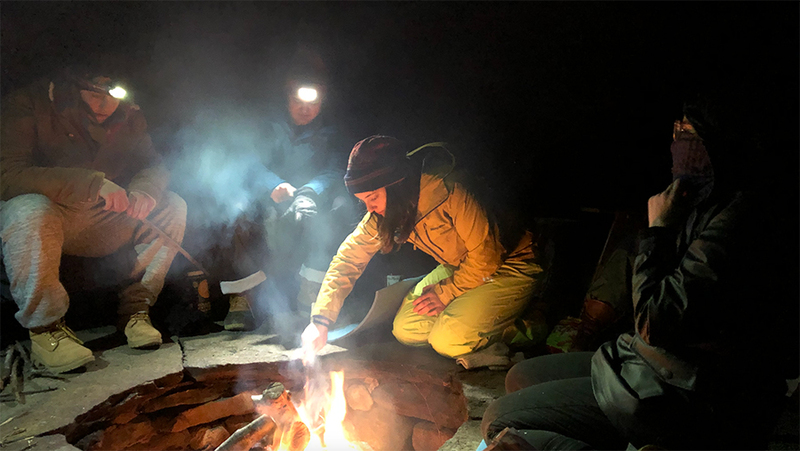 Course instructor Stefanie Frazee—who teaches in Smith’s exercise and sport studies department and manages the college’s Outdoor Leadership program—said the interterm course was aimed at students with varying levels of experience with such adventures. For Lily Beaubien ’21, the focus on theory, as well as practice, was among the best aspects of the interterm course. One of the skills students practiced during the course was cooking outdoors on backpacking stoves. Joyce Huang ’22 said designing and participating in group challenges gave her a sense of independence. 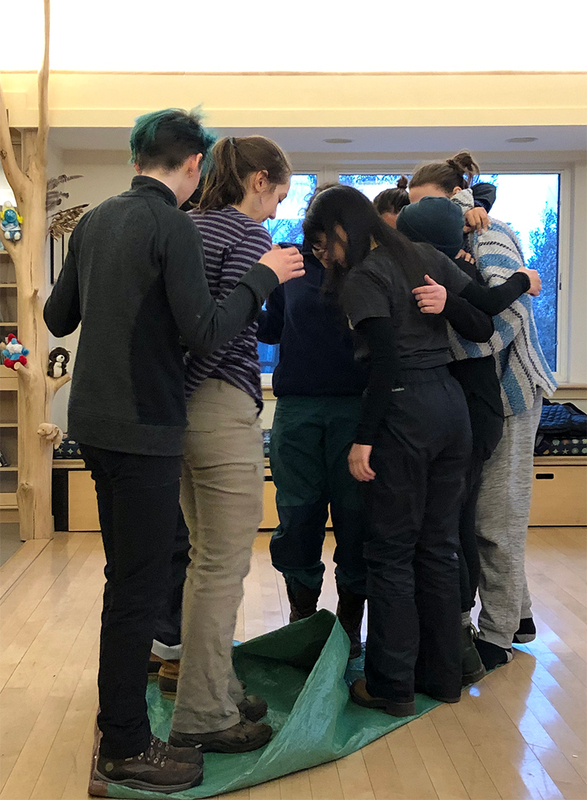 For her final “Magic Carpet” project at the field station, Julieta Rendon-Mendoza ’21 instructed students to stand together on a small green tarp and flip it over without anyone stepping off the surface. Somehow, the students managed to wriggle, hop and change positions so that the “carpet” turned over without anyone falling off. Key to the challenge was the fact that only one group member was allowed to speak. Although she had experience leading outdoor activities at a high school summer camp in her home state of Washington, Rendon-Mendoza said the interterm course helped her further “stretch” those skills. In one exercise, students stand together on a tarp and try to flip it over without anyone stepping off the surface. Smith students and employees now have discounted access to a new, regional bike sharing program. ValleyBike offers 500 electric, pedal-assist bikes to 50 stations throughout the Pioneer Valley.